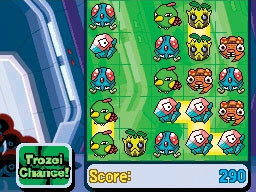 The Phobos Battalion has been stealing Pokémon and transporting them to their bases in Phobos Mobiles. Lucy Fleetfoot is on a mission to free the Pokémon. Using her Trozei Beamer, she can teleport Pokémon from the Mobiles to safety by grouping them in the same species. Move rows and columns of Pokémon around to create lines of four or more. As they vanish, you have a "Chance" moment to line up three Pokémon, then two, to also make them vanish. As well as the Adventure and Endless modes, you can play local single-cart Battle Mode and a Co-operative Mode.